Subatomic physics tells us that there is no such thing as physical matter. Everything is energy. Energy is vibrational and it’s rate of vibration or frequency determines it’s form i.e. light, sound, magnetic, electric. So everything in the universe is vibrating at different frequencies which are measured in units of Hertz (Hz). Good vibrations are uplifting. This is why our mood can change by beautiful sunlight, a bright coloured room or a beautiful piece of music. Everybody resonates at their own vibrational level. Vibrational medicine in it’s many forms focuses on uplifting your vibrational state. It is a fact that when people are sick, their body’s physical voltage is low. 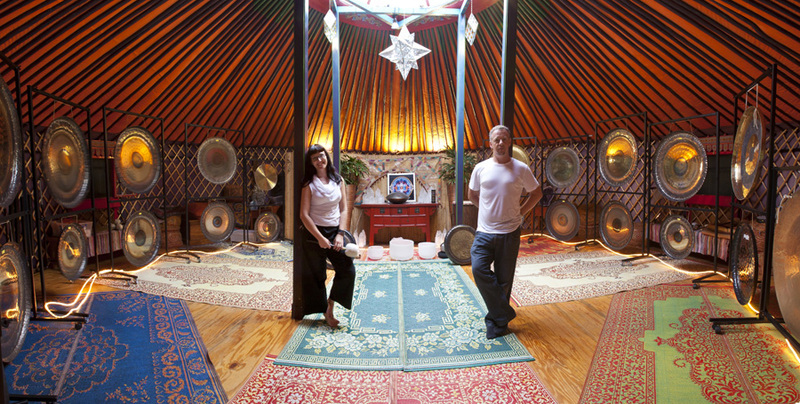 The experience we offer gives you the opportunity to shift your vibration through sound in a unique inner journey that we like to call our ‘healing hertz’. Some find themselves travelling the sound waves into a lucid dream, others find the profound experience of the disappearance of their physical body. Regardless of the conscious experience, we provide you with an opportunity for deep relaxation, dropping your body into it’s own natural healing state, and support you through transformational shifts, clearing you back to a state of calmness and light happy feelings. Our instrument of choice is the ‘gong’. The sound resonance of the gong is one of the most powerful & pure ways to experience sound vibrations – it’s like an internal cellular massage, nourishing the body, mind and soul ! Ancient instruments, including gongs and Tibetan singing bowls are ‘struck’ in specific rhythmic patterns to create vibrational sound harmonics. The sounds interact with your nervous system and brain waves. The harmonic vibrations slow down the respiratory rate, brain activity and heart rate, creating a deep sense of wellbeing. From this space of good feeling, the body then potentially works its own magic to rebalance and rejuvenate you. Changing brain patterns can also be called ‘alpha’, ‘beta’, ‘theta’ healing. Essentially they are slowed which gives you a sense of space and clarity away from your everyday thoughts. Some of the vibrations act like ultrasound and penetrate the body which can dislodge and break up some matter. This is similar to that in use by medical circles such as breaking down of kidney stones. Much of the experience is in fact not what you hear with your ears. Where and why would you use It? Sound baths / healings are an effective tool to support healing of personal issues and great for group retreats or corporate workshops. It’s a perfect way to finish the day and to relax after a busy schedule or consider it for the start your team building exercise to enable your attendees to relate from a calm centered space. What others have said about sound as a healing tool? Many ancient & indigenous cultures (including the Australian Aboriginals and Native Americans) used vocal toning and repetitive sound vibration with instruments in sacred ceremony to adjust any imbalance of the spirit, emotions or physical being. And now with much scientific proof, sound is routinely used in different areas of medicine (ie. treatment of kidney stones), holistic healing and counselling. Research has even found that cats don’t just purr when they are content, they purr when they are injured or in pain too – healing themselves with sound! Three cat species purr between the frequencies of 20Hz – 150Hz, which have been found to be the optimum frequency range for the repair of tendons, fractures and stimulation of bone growth. or bring balance and harmony into your daily life.